Femme Fatale Records: The 2017 Femme Fatale Records calendar premiered at this year's Monster Bash and we are almost sold out! 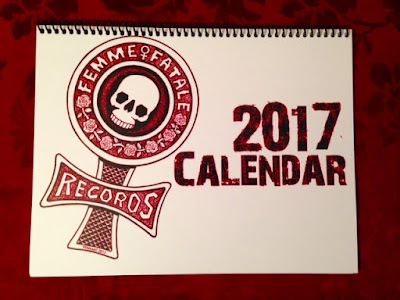 The 2017 Femme Fatale Records calendar premiered at this year's Monster Bash and we are almost sold out! A great calendar and a great cause - congratulations on another year's excellent calendar! Glad I got my 2017 calendar! I think this is the best one yet! The quality of paper is really good and the pic choices are superb! Thanks for another opportunity to help a worthy cause!